Le Concert Spirituel was essentially a Parisian concert series held at the Tuileries Palace, begun in 1725 as an opportunity for musical performances during Lent and other Holy Days when secular musical activities like opera were forbidden. The concerts continued until 1790, just after the beginning of the French Revolution. 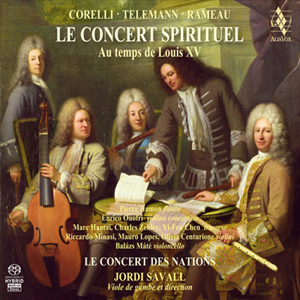 The music of French composers filled most of the programs, but German and Italian music was occasionally heard, and this CD includes five pieces by Corelli, Telemann, and Rameauthat were known to have been played at the concerts. Jordi Savall and Le Concert des Nations, one of the many stellar ensembles he is responsible for founding, play these works with such surging vibrancy that anyone who thinks of the Baroque as a period of stiff formality would be disabused of that notion on hearing these performances. The Suite from the opera-ballet Les Indes galantes, by Rameau, the most forward-looking of the three composers, is a terrific example of how Baroque music can be dignified and at the same time light-hearted to the point of being humorous. The performers play it with obvious delight in its droll depictions of “exotic” foreign cultures and with appropriately flamboyant abandon. The Overture to Telemann‘s Suite in E minor for two flutes and strings is an example of the exceptional sophistication and musicality Savall and his ensemble bring to the music. Their close attention to the movement of the music is evident in the subtle variations in tempo that give it such a buoyant grace. Throughout, the musicians play with affectionate care and attentiveness to the shape and direction of each phrase. It practically goes without saying that this group’s tone quality is impeccable and full, and that the players listen to each other so carefully that the balance is always beautiful and the ensemble seems to breathe as a single organism. Savall is an agile and sonorous soloist in the Telemann Suite in D for viola da gamba and strings. As is the case with all its releases, Alia Vox’s hybrid SACD is beautifully produced and the sound is clean, with a springy liveliness.